Make this pincushion for all your sewing friends! 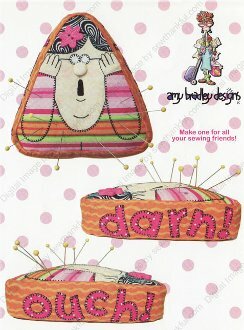 This pincushion pattern includes instructions & patterns to make this 5 1/2" tall pincushion. The technique is fusible applique and there are two versions included for hair or a hat. The letters are included for the sideband which reads "ouch!" and "darn! ".